The decades following passage of the U.S. Animal Welfare Act in the 1960s are marked with wide-ranging and significant changes to the administration, oversight, and responsibility for daily operations of institutions engaged in laboratory animal research. The intent of the legislation, and the central purpose of the accompanying and continuing changes, is to best ensure the welfare of animals in research. This goal encompasses all aspects of laboratory animal care— their participation in ethical scientific studies, their humane treatment during daily care and maintenance, and their receipt of the highest standard of clinical care. Do scientists engaged in animal research perform all of these duties? No. In fact, by law, it is not scientists who have the ultimate responsibility for oversight of all issues involved in animal welfare, but the attending veterinarian and institutional officials. In practice, there are a range of individuals who share in the responsibility to provide for animal welfare. Many different types of expertise are needed to provide the best management of a laboratory animal research facility. Scientists working with animals have expertise in the topic their research addresses, in the activities that research requires, and in use of animals in research. Depending on their research area, background, and training they may have tremendous depth and breadth of knowledge about the animals’ behavior, psychology, physiology, and other systems. But it takes more than this to accomplish all that is needed to maintain an animal research program. 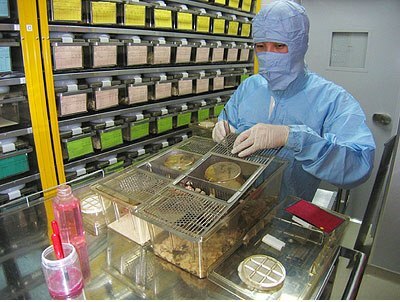 Animal research programs always include veterinary staff to provide the animals with clinical care. They typically also include animal care staff to provide daily husbandry; behavioral management staff to provide environmental enrichment and animal training; and facility management staff who work with engineers and others to maintain clean and safe environments for the animals. In addition to facility management, clinical care, and daily husbandry there are also divisions of personnel charged with evaluation and oversight of the research, including the Institutional Animal Care and Use Committee, associated staff, and compliance officers. Oversight for the entirety of the animal research program typically rests at the level of university administration. In sum, the number of individuals and divisions now involved in ensuring laboratory animals’ welfare and humane treatment in ethical scientific studies extends far beyond the scientists most identified with animal research. What does this mean? It means that there is a great deal of shared responsibility for both successes and the occasional failures in the conduct of laboratory animal science. It also means that any discussion of continued improvements in the daily activities that affect animal welfare, as well as changes in policies that govern the conduct of animal research, should benefit from teamwork among these different stakeholders. It is long past the time that our community should have abandoned this approach and required more from each of its members and divisions. To accept anything less is a mistake. Absence of accurate information, accompanied by the failure of institutions and their representatives to engage in public dialogue, only further erodes public trust. The intent of the AWA, subsequent legislation and policies, accreditation programs, revisions of guidelines, and continued increases in regulatory oversight is to ensure the best animal welfare and humane treatment possible. In the rare cases where the apparatuses put in place to achieve this goal fail, sometimes from accident or human error, two things must happen. First, it is contingent upon all of those involved to immediately work together to identify the reason for the failure and ways to minimize the possibility that it occurs again. Second, those ultimately responsible for oversight should provide the public with accurate information, explanation, and opportunity for discussion. At the very least, they should be able to articulate the rationale and their support for the research programs and their contribution to scientific and medical progress. Are we suggesting that attending veterinarians and institutional officials open their doors for daily chats with animal rights activists? No, but we do believe that addressing legitimate public concerns and questions about their animal research programs are among the key obligations of those charged with oversight and conduct of those programs. While scientists can address questions about the scientific side of animal research, we need the laboratory animal care and veterinary staff to provide their expertise in service of addressing public questions about clinical care and husbandry. If they do not, it will be no surprise if the public view of animal research is disproportionately colored by the relatively rare adverse events and the misrepresentations of animal rights activists. Many believe that it is possible—and perhaps acceptable—to ignore this part of reality in order to focus on more immediate demands for time, energy, and resources. Consider, however, that a fundamental part of the AWA, accreditation, regulation, and professional obligation is actually to ensure communication with the public that supports animal research. Thus, it is our entire community who share a primary obligation to engage in the dialogue that surrounds us. Posted on January 24, 2012 January 24, 2012 by EditorPosted in Campus Activism, News, Science NewsTagged animal research, animal welfare, animal welfare act, speaking of research, veterinary.